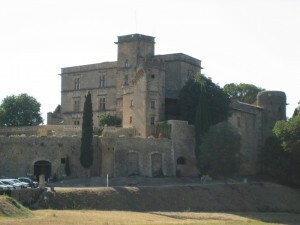 Whether it is a trip around the hanging villages of the Luberon, the salt flats and rice fields of the Camargue, the beautiful coastal Calanques, the twisty roads of Mont Ventoux and Mont Saint Victoire, or a tour around the numerous vineyards and lavender fields of Provence , we promise you that you will not leave disappointed . The list of tours above is by no means exhaustive and each tour is adapted to the ability and previous experiences of our visitors, as well as the weather conditions on the day. Our Discover Provence tours run throughout the year with each tour starting and finishing at Classic Bike Esprit in St Rémy. Join us for a single day during your stay , or spend several days touring with us to a different area each day , and really get to discover the beauty of this region. And an added bonus for the rider – you get to change bikes during the day if you want to try out more than one of our classics. 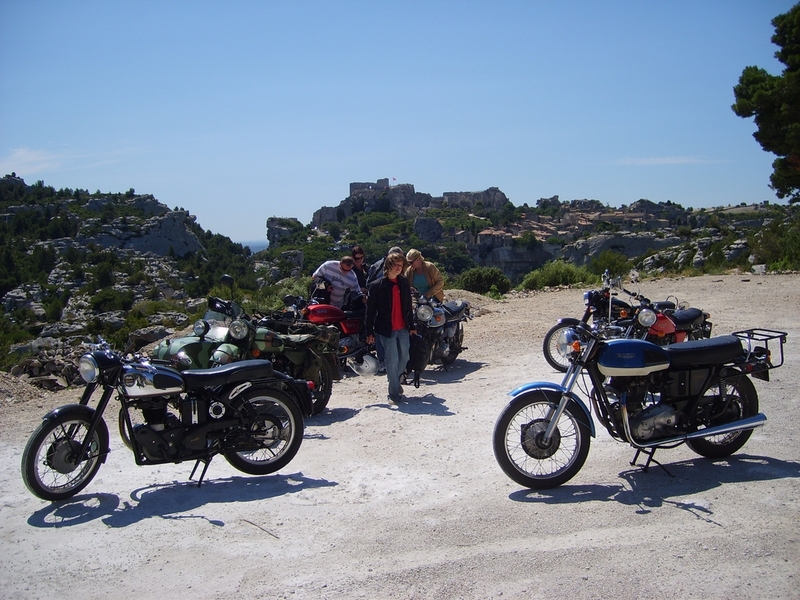 Tours are organised in small groups of a minimum of 3 bikes (no more than 6 ), or ask for a quote for a private tour. This has to be one of our favourite areas. 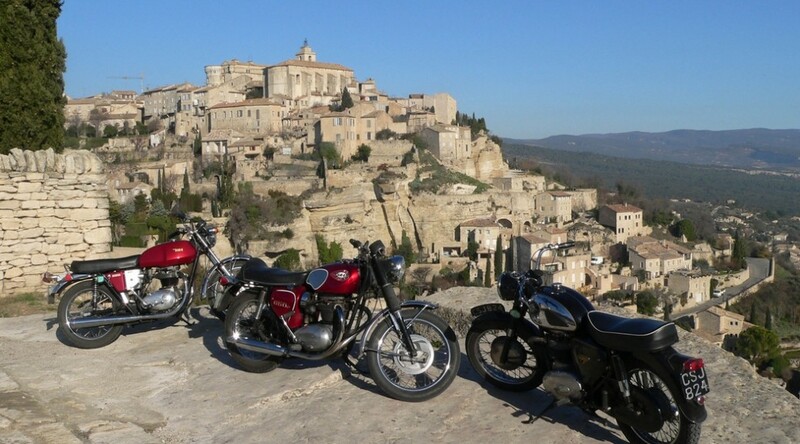 Riding northeast from St Rémy to the mountainous region immortalised by Peter Mayle in “A year in Provence”, the run to the Luberon wine region is a relaxing ride through hidden Provence. 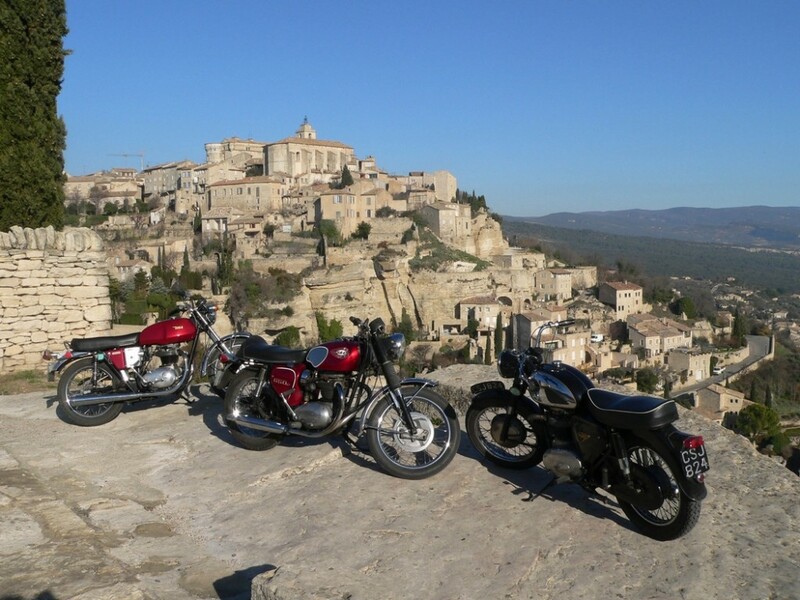 Marvel at the ascent to the spectacular mountain villages of Gordes, Bonnieux, and Goult, and enjoy the ride as we breeze through the lush valleys at Lourmarin, Roussillon, and Lacoste. The Luberon range is broken into two parts –le Petit Luberon on the west side and le Grand Luberon on the east, and the landscape between, crossing le Plateau de Vaucluse, as far north as towering (1909m) Mt Ventoux. We have several different tours through this region as there is so much to see. To try and do it all in one day would certainly defeat the purpose of the visit! A beautiful day out this ride is very relaxing and should never be rushed! This gentle run through premium wine country is suitable for all riders and is unsurprisingly an extremely popular pillion choice. This has to be one of the favourite areas for our clients , and is ideally suited to the smaller capacity lighter bikes such as the Velocette Venom, Ariel NH or RE Bullet. If riding with a passenger one may wish to chose a BSA A10 or an A65. The fun starts straight away as we depart from St Rémy and traverse the Alpilles via the Val d’Enfer (“valley of hell” ), which was the inspiration for Dante’s inferno. Passing fantastic views of the citadelle of les Baux we continue east along the small lanes in the Alpilles national park and cross the Durance river at Mallemort to enter another national park…the lovely Luberon. This is the mountainous region immortalised by Peter Mayle in “A year in Provence”. The run to the Luberon wine region is a relaxing ride through hidden Provence. We head eastwards for Lourmarin and enjoy a great ride along the Combe de Lourmarin climbing up the ridge towards Bonnieux. A popular stop before lunch is the Forest of Cedars on the top of the petit luberon ridge at a height of approx 800 meters. Here we can view the route we will be taking in the afternoon through the famous hanging villages of Bonnieux, Gordes, La Coste and Peter Mayles’s Menerbes. Not that PM owns the village but he could probably afford to buy it, just as Pierre Cardin has invested much of his money into La Coste, as did the Marquis de Sade! This area has real history and although popular in the summer months with tourists is still extremely enjoyable if you know where to go to avoid the crowds. 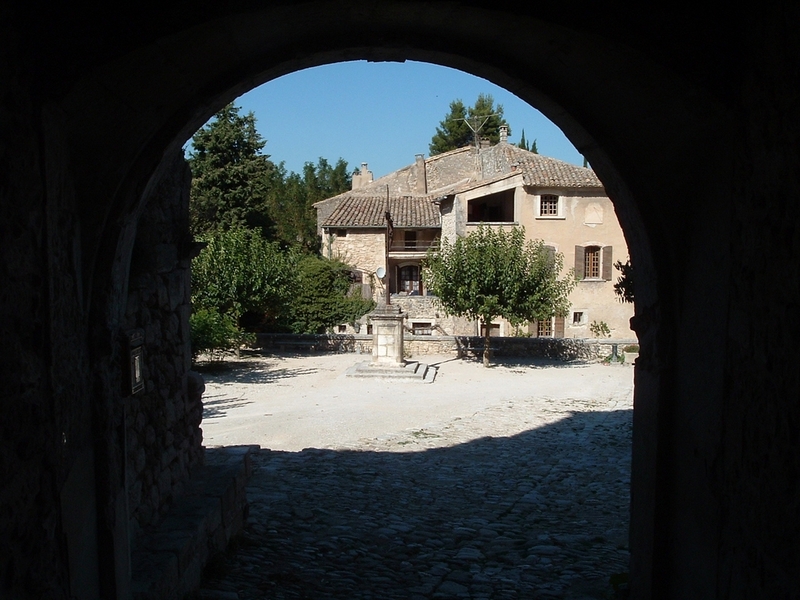 After passing by Oppede Le Vieux, the oldest and highest of the Petit Luberon villages, we leave the national park crossing the Durance near Cavaillon. 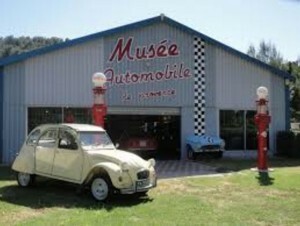 A popular refreshment stop in the afternoon is at Orgon where the classic car and bike museum is always welcoming. The final run back to St Remy via the country route to Eygalieres is a great way to finish a memorable day. Not a big mileage , but enough quality time in the saddle for the bikers and loved by the passengers for its sheer beauty – the picture postcard vision of Provence. 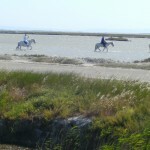 Join us on a lazy journey through the world-famous Camargue region south west of St Rémy as we discover unspoilt scenery, pink flamingoes, black bulls , rice fields and giant salt flats. Our tour starts with a glorious ride over Les Alpilles (the little alps), then following long straight and empty roads to the regular ferry service that traverses the Rhone river. Now we are in the real Camargue where we drop down to the Mediterranean sea returning inland to stop by a very traditional rustic restaurant for lunch. A good first day to get used to riding the classic bikes on uncluttered and non demanding roads. Returning by the same ferry we finish the afternoon riding in the more hilly area of the national parc les alpilles. 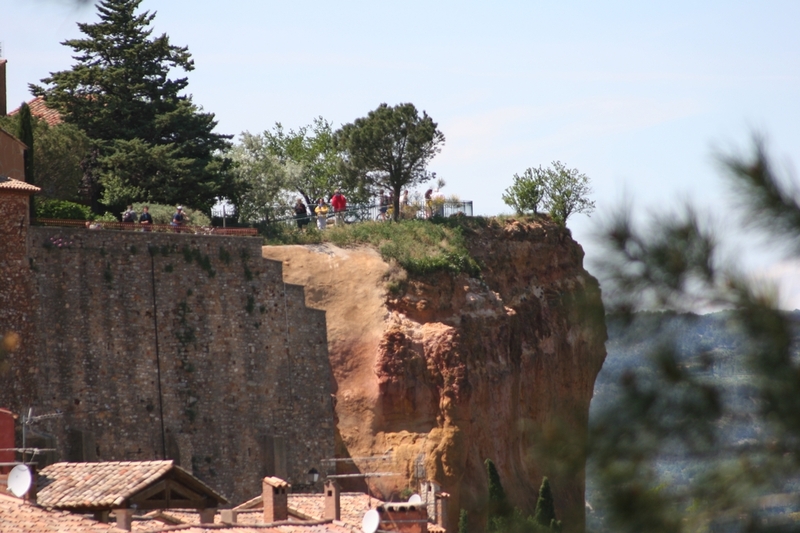 Note that when the strong Mistral wind blows this is one area to avoid and that this wind can blow at any time of the year so there is no guarantee that this is always a day one tour! 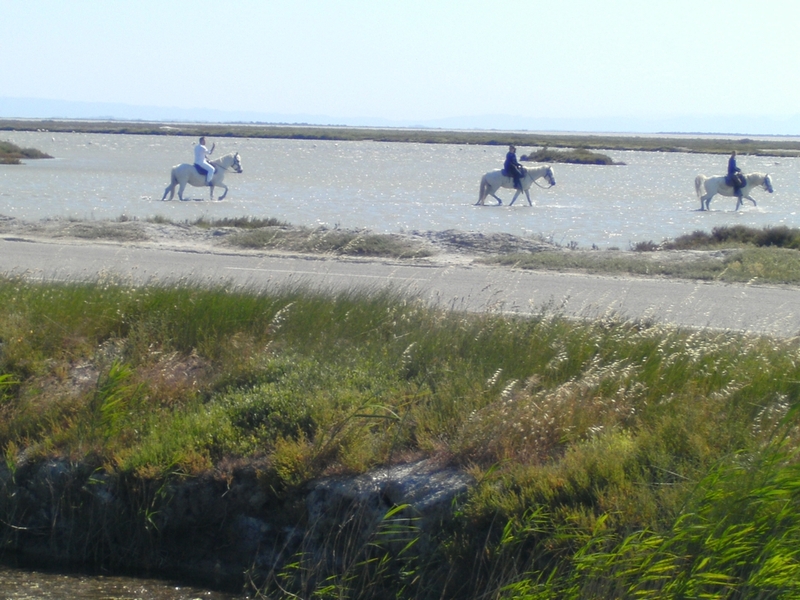 Very popular with our clients as an ‘orientation’ day and a good chance to get back into the swing of things due to it’s less demanding nature, this lazy trip through the Camargue is the perfect place to start your touring holiday. Wine growing is such an important part of the Provençal culture that we could not possibly omit a tour that will take you along the picturesque Route de Vins. With such an abundance of vineyards it is difficult to decide which direction to take; north up towards world famous Chateauneuf du Pape then beyond to view the lesser known growing areas of Gigondas, Rasteau and Vacqueyras , all renowned for their good quality reds , or east towards the Roman city of Aix en Provence and Mont St Victoire, particularly acclaimed for their excellent rosé wines …..
A full day of motorcycling really suiting the bigger capacity machines such as the Norton Commando, Honda 750 K2, or Moto Guzzi. Departing from St Rémy we skirt the south side of Avignon on small roads to avoid the traffic. First stop is after an hour of riding at the delightful and medieval village of Venasque. Coffee, croissants and pains au chocolats can be enjoyed at “La Fontaine” next to, not suprisingly a fountain, right in the centre of the village. Before lunch at Sault or Aurel we tackle 28kms of twisty road of the Gorge de la Nesque. After lunch we tackle the 1912 meter Mont Ventoux stopping at the top to take in the panorama of Provence.